4:26 ¶ He also said, “The kingdom of God is as if someone would scatter seed on the ground, 27 and would sleep and rise night and day, and the seed would sprout and grow, he does not know how. 28 The earth produces of itself, first the stalk, then the head, then the full grain in the head. 29 But when the grain is ripe, at once he goes in with his sickle, because the harvest has come.” 30 He also said, “With what can we compare the kingdom of God, or what parable will we use for it? 31 It is like a mustard seed, which, when sown upon the ground, is the smallest of all the seeds on earth; 32 yet when it is sown it grows up and becomes the greatest of all shrubs, and puts forth large branches, so that the birds of the air can make nests in its shade.” 33 With many such parables he spoke the word to them, as they were able to hear it; 34 he did not speak to them except in parables, but he explained everything in private to his disciples. Grace and Peace to you from our Lord and Savior, Jesus who is the Christ. Amen. When Jesus started to face opposition from groups like the Pharisees and Scribes, He started to address the crowds in parables. The purpose of the parable is twofold. On one hand, it is easy to understand the story as it comes from real life. Jesus used parables using farmers, fishermen, investors, and other professions to compare them to a spiritual truth He wanted to make. But the other purpose of the parable was to hide the truth from those who were not given the key to understanding the parable. In the parable in this passage, it is easy to understand what the sower is doing, and that plants grow on their own without intervention and without the farmer knowing why the seed becomes a plant. I would suppose today with our scientific understanding, it is not as much a mystery as it once was. But obviously Jesus was interested in saying something more than to observe how they grow. Part of the key to understanding the parable is to carefully read it. One must bring two questions to a parable. One is: “What does it say?” The other question is: What does it NOT say.” Let’s use these two questions to analyze the parable. First of all it says that this parable describes a truth about the kingdom of God. It is like a man who threw the seed upon the ground. It does not identify what kind of person threw the seed. This detail is not important to the parable. This tells us the parable is not about the man or woman who threw the seed. It could be any man or any woman. It then says that this sower went on with life night and day. It does not say that he cultivated the field, plowed it, watered it, weeded it, or anything else other than days passed. This means that what the man did other than scatter the seed is unimportant to understanding the parable. In fact, this man seems to be somewhat ignorant of the process. He could see what was happening. The plants came up and went to the maturing process by themselves without mentioning any intervention on the man’s part. The Greek word about what happened is the same as our word “automatically.” It is something in the seed and the hand of God that makes it happen. It is in the DNA. When the harvest is ripe, this man is fast to take the sickle to the grain to harvest it. The recognizing the proper time to harvest and then making haste to harvest it before the fowl and insects ate up the ripe grain is an important detail to the parable. Now we have to realize that Jesus is not giving practical advice. What do these two parables say about the Kingdom of God? Let us look at the first parable. We are called to sow the seed of the kingdom. However, there is a certain humility to this. The gospel is not about us. It is our job simply to scatter the seed faithfully. We like to think that we have to control the process of evangelism. We come up with schemes to sow the seed. We try to prepare the ground, weed, cultivate, etc. We want to control the process. What we have to realize is that it is the gospel itself which causes growth. It’s not what we do but what the Gospel does. God has put the DNA in the message. It comes up of itself, and not by our effort. We don’t even have to understand why it works. We simply get to see it grow. This does not mean we simply sit back and watch. We certainly are called to nurture the seed. We are to teach them whatsoever things Jesus has commanded. What we do have to do is to do it God’s way and not our own. We must feed them the gospel itself, to tell them what Jesus began to do and to teach. The second parable is prophetic of the growth of the church. The church began with a tiny group of disciples who followed Jesus, Days and nights passed, yet at the Day of Pentecost, the church had only 120 members which is practically nothing compared to the 100 million inhabitants of just the Roman Empire. Then there were 3000, then 5000, which is still not numerically significant. But within 300 years, it conquered the Roman Empire. The seed is tiny but powerful. In the beginning, God speaks a little word and the entire cosmos comes into being. Jesus speaks a little word and the blind see and the deaf hear. Jesus speaks a word and the dead man comes to life. 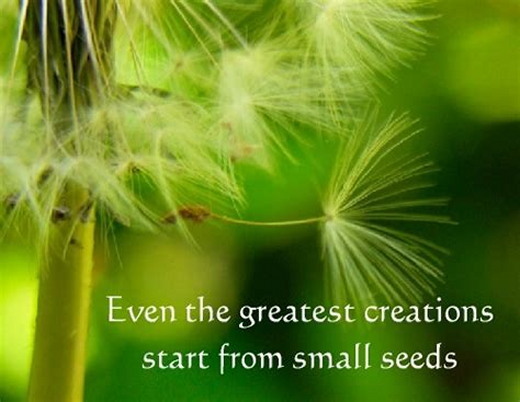 It is not the size but the power that resides in the seed. So here we are 2000 years later. Some think that the seed has lost its power. The church seems to be declining in influence. The era is called “Post-Christian.” Is this true? Of course not! The seed of the gospel is just as lively as ever. It just needs to be scattered once more. We need to scatter the pure Gospel. The trouble is we have tried to genetically modify its DNA, thinking we know better than God who made the seed in the first place. Instead of increasing the yield, a weaker plant comes up. It might look large and healthy perhaps, but the purpose of the plant is to produce fruit. We have to stop trying to monkey with the gospel and simply to proclaim it. It is not dependent upon the character of the preacher either. Any preacher who preaches the truth of the Gospel will do. The personality is not important. Billy Graham indeed scattered much seed in his day, and it resulted in a large harvest of souls. But those who became Christians under his ministry did not become Christians because Billy Graham spoke it. Rather it is because God used the preaching of Billy Graham. It is the word of the Gospel which Billy Graham which brought those who were dead in trespasses and sins to life. Billy Graham has gone to his reward now, but if he were here, I believe he would agree with this statement. The one who sows the seed does not know how the seed grows and produces a large crop. He just knows that it does. Sometime the yield varies as we see in the parable of the sower. I do not know what Billy Graham has had the success he has had in ministry and I have not. But I do rejoice that people have been born into the Kingdom of God, by whose hand does not matter. We just need to keep throwing the seed and casting the dragnet. Finally, we have to know when the harvest is ripe. We need to be able to see that the time to reap has come. This must be done by God’s help. The sickle is sharp. There is pain involved, but after the seed has matured, the time comes to harvest the wheat. It might take time for the word to come to maturity in the people we witness to. Days and nights might pass, but the day comes in which the person is ready to make a commitment to follow Jesus. Harvest too soon and the fruit will be immature and die. Harvest too late and the seed might be carried away by Satan. Sow the pure seed of the Gospel. Be patient and trust God to make the seed grow. Then be ready to harvest. Do this enough times and the Kingdom of Heaven will grow great and God will be glorified. The Bible texts of the Old Testament, Epistle and Gospel lessons are from the New Revised Standard Version Bible, copyright 1989 by the Division of Christian Education of the National Council of the Church of Christ in the USA, and used by permission. Sermon contributed by Rev. Dr. Mark A. Barber, McDonald United Methodist Church, McDonald, Tennessee on Jun 14, 2018. What do these two parables say about the Kingdom of God?